This is a screenshot of a conversation I had today with Rick Spencer, leader of the Ubuntu Desktop Team at Canonical. 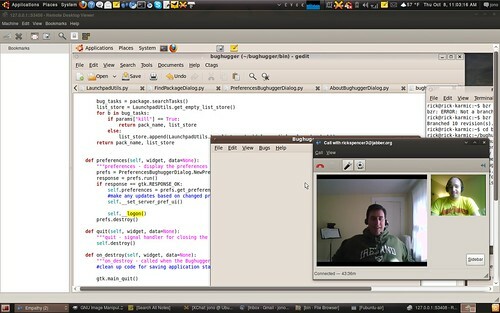 Using the Ubuntu 9.10 Karmic Koala, we are having a video chat using Empathy, while also sharing Rick’s desktop, also using Empathy, and he was demoing some of the work he been doing on Bughugger, a bug management tool that he wrote using the awesome quickly framework for rapid development of applications on Ubuntu. This is collaboration at its finest, all driven by Free Software and delivered by Ubuntu. This does look indeed awesome. Now if there could be some sort of integration or connectivity with Google wave, we might have ourselves the only collaboration tool anyone would need for any platform. This looks fantastic. I’m waiting for a few more feature from Empathy and a tiny bit more stability before I make the switch from Pidgin, but overall Empathy is looking to be the smarter choice. Ubuntu 9.10 is looking to be a great release when it arrives later this month. Yes! Ubuntu needs moar tilling! Why isn’t dwm transmogrified into a Compiz plugin? That would be truly awesome! can’t you tell Mark how ugly it is. The new humanity icons are nice. There’s work ongoing to add Telepathy support to Kopete, and add Telepathy-based desktop sharing to the KDE VNC components (whose names I forget offhand). Of course, it will interoperate with Empathy and Vino/Vinagre on Gnome! Yeah right. Maybe in a few years they’ll consider that. Until then, KDE may implement it but Kubuntu will compile that option out. Great job and thanks for the news. Very timely as we’re having “Karmic Koala Night” in Vancouver tonight. An observation: There’s a lot of (too much) skepticism about (the switch to) Empathy, and the state of voice/video chat in general on Ubuntu. Could you or the developers post some screencasts of this so that we can help spread the good word with some evidence to back it up? Wow, I’m impressed. It seems like the pace of progress is picking up. I think Karmic Koala will be a good release. Let’s hope this isn’t collaboration “at its finest” — I think this is great but we have a lot of room for improvement. I had a conversation with Jorge over Empathy the other day. I can’t wait until audio and video chat becomes a standard part of the free software collaboration repertoire. Seeing and hearing Jorge really inspired me. It truly felt like we were collaborating and not merely communicating. Ubuntu has a great opportunity to lead in this direction by leveraging voice and video chat to make our community even stronger. I can’t wait to use desktop sharing and audio chat to conduct user testing and QA! I got the Beta the other day. I’ve been running it in VMware Fusion on my Mac. So far it seems to be a great release. I remember back when I started using Ubuntu (6.04 I believe) and I used to have to make a lot of changes in order for it to do what I wanted it to do. It’s amazing how much progress Ubuntu has made over the years. I get excited everytime there is a new release. I look forward to seeing what the future hold for Ubuntu and Linux as a whole. Yes, I have tested Empathy as well. Such a great product. There needs to be more WOW factor, that will attract the general public to Ubuntu. Leading the revolution is betting than following it. Yay. Almost catching up to what OS X could do 3 or 4 years ago. Keep trying, though. This is definitely what I have been waiting for. Linux lags way behind Windows in providing AV messaging. I always have to go back into XP to chat with my brother who lives 500 miles away. The sad thing is that I still have to do it. AV sessions still do not work in Karmic for MS messenger. I am told it will work in Lucid. Maybe it will, but probably not with my web cam (which works OK in windows without any trouble, but took ages to get working in Ubuntu for Skype). I get the feeling that the Ubuntu developers need to get their heads out of the clouds, come down to earth and concentrate on providing the quality of AV experience enjoyed by Windows users. Sorry to say, but I’ve yet to see this work. I’ve got 2 Karmics installed on Virtual Box. Using yahoo accounts I can only chat. Nowhere is it mentioned what kind of account you need to have for this to work? What Vinagre and Vino versions are required? If anyone has this working please post a screencast on youtube that shows the whole process from start to finish. Thanks a million in advance! im using 9.10 but i see no audio/video buttons being enable.. but im using a yahoo account does this matter? Can it auto answer video and sound calls? As in Skype Beta 2.1.0.81, there is an option. Somehow all I can see is the top right hand message box appear, but nothing else for answering a call, it is required to left click into mail icon in top right hand corner which appears green colour, then find the contact, and click on the contact and finally answer call. Seems way to long. I need to install a dvd/cd burner, and am wondering if there is one that works extremely well with ubuntu. I can’t find any help anywhere that tells me how exactly to set up a ‘server’ on Empathy. As such it is installed but useless to me. So much knowledge is assumed and little explained. When I set up msn on windows I just put in a username and password. So having installed my very first Ubuntu 11.10 OS yesterday, having all sorts of problems with ttf-mscorefonts-installer being half installed, and getting advice on the internet to ‘go into synaptic’ only to find hours later that there is no synaptic, I have spent more time typing codes into a terminal and rebooting to make me realise that linux is still a programmers operating system. All of the ‘solutions’ offered to me involved installing something else and nothing was allowed to be installed because of the dreaded half installed fonts package. I only tried to use the Empathy in an effort to ‘talk live’ to someone about the problem. But that ‘solution’ ended up in another problem – “network error”. I finally fixed the fonts problem and downloaded Cellestarium and on first use it just crashed and froze the system – where’s my Cntrl Alt Del to get control back – no such joy – another reboot. So, I’ll grant you, your picture above looks nice and cosy. But I can only agree with the word ‘awesome’ if by it you mean BIG and after it you put the word hassle. ‘m about as ‘excited’ as someone tied to a railway line hearing and seeing the massive engine coming straight at him. Someone should shadow a few first time windows user trying to use Ubuntu and it’s features and see exactly how ‘blind’ they are, especially when things go wrong. I want to love linux, really, honestly, I do, I hate windows. But seriously, after two days on this and all that code to type just installing something or to ‘fix’ the installation, I think it’s time to put it away and come back to linux in a couple more years when you don’t have to be a programmer to use it. So, I’ll grant you, your picture above looks nice and cosy. But I can only agree with the word ‘awesome’ if by it you mean BIG and after it you put the word hassle. I ‘m about as ‘excited’ as someone tied to a railway line hearing and seeing the massive engine coming straight at him. Someone should shadow a few first time windows user trying to use Ubuntu and it’s features and see exactly how ‘blind’ they are, especially when things go wrong. But they are not allowed to help them. I would like help with Ubuntu 13.04. I basically know nothing and need to ask questions. So far I have not been able to access any other sites to ask. Can anyone help.